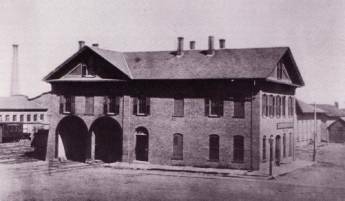 Although railroad depots have many similar characteristics - a broad, low roof atop of small, rectangular, one-story building, often of masonry construction � architectural details varied quite a bit. Many stations were very simple and utilitarian in nature, while others closely followed the architectural fashions of the era. 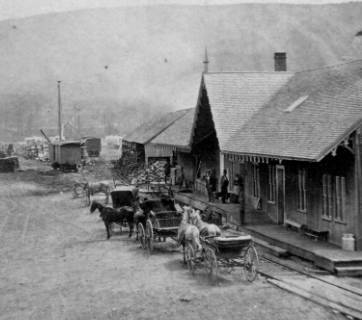 Most stations in Vermont were constructed prior to 1920, as the automobile began to replace the railroad as a primary means of transport. 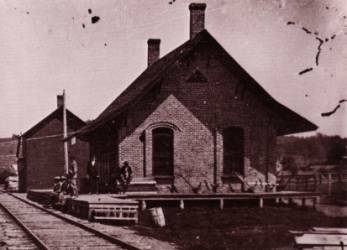 The following images illustrate some of the common styles used in station construction from the late 1840s through the early 20th century. 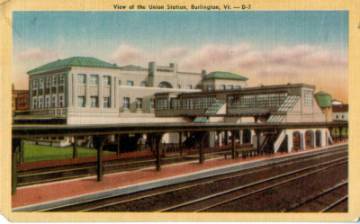 Many of the first stations constructed at the end of the 1840s and early 1850s were rather large, monumental stations in railroad hubs, like Burlington, Rutland, or St. Albans. These stations were frequently constructed in the popular Greek Revival style of the time, as characterized by full pediment roofs, cornice returns, window lintels or pediments, and columned entry porticos. The two images below are excellent examples of the high-style Greek Revival train depot, constructed c. 1850. 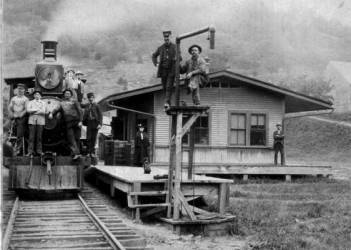 However, many smaller, more rural stations were constructed in a very simple vernacular style. Occasionally there are small details that help define a style or identify a period of construction. 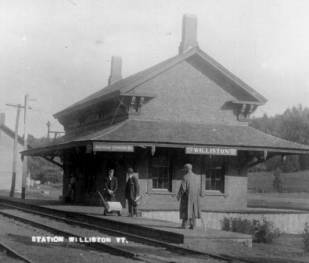 The image below is an example of a Greek Revival station in Williston, which was constructed c. 1848. The cornice returns on the gable end and the full entablature of the roof (the projecting edge of the roof and the wide bands beneath the eaves) are indicative of the era. The paired brackets beneath the eaves were likely added at a later date, as they are more characteristic of the c. 1870s Italianate style. Again, many structures were simpler and more vernacular in their construction. The stations in the images below have some small details that indicate the Gothic Revival style. The image below has simple vergeboards in the gable end and peaks placed over the windows that reflect Gothic point-arch windows. The six-over-six sash windows also reflect a pre-1870s construction. This type of window was common during the 1850s and 1860s but was widely replaced with two-over-two sash windows in the 1870s. The station below reflects very vernacular construction with the influence of the Gothic Revival style. Again the six-over-six and six-over-nine windows indicate a pre-1870s construction date, as do the raking eaves (eaves that extend straight down past the wall and do not angle in to create cornice returns). The windows and doors also have a very slight peak, reflecting the pointed-arches of the Gothic Revival style. 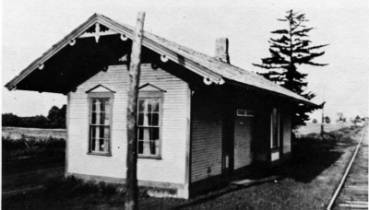 The defining feature on this simple, vernacular station is the steeply-pitched roof. Brackets, beneath the eaves, were also commonly used on Gothic Revival style. During the late 1860s and into the 1880s, the Italianate and French Second Empire styles were quite popular. The Italianate style in the image below is characterized by the large cupola, the round arch windows with hood moldings, and round windows in the gable ends, and the details beneath the eaves. Similar to the Italianate, but characterized by its mansard roof, is the French Second Empire style seen below. The mansard roof is flat on top and extends down to encompass the upper story, often with flared eaves. 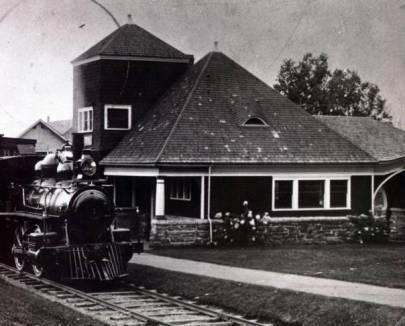 The image below provides an excellent look at a Second Empire station and its mansard roof. 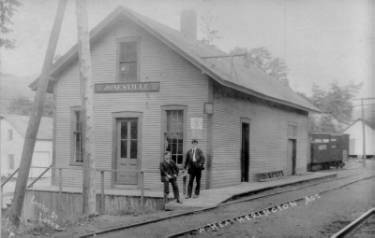 The small vernacular station in the image below does not appear to have any stylistic references. However, the two-over-two sash windows indicate a construction period of the 1870s or 1880s. Two-over-two windows were popular during this era and were largely replaced by one-over-one windows in the 1890s. The exuberant Queen Anne style of the 1880s and 1890s may have also been used in train station design in Vermont. The Queen Anne style is characterized by its excessive ornament, towers, bay windows, wrapping porches with turned posts, and elaborate stickwork (detailed woodwork). Also popular during the 1880s and 1890s were the Shingle style and the Richardsonian Romanesque style. 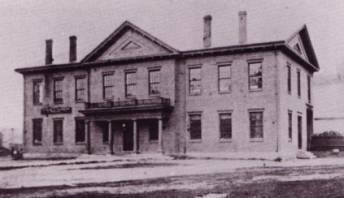 The Single style, seen below, is characterized by its wood shingles, large wall planes, deep porches, and broad, encompassing roof. 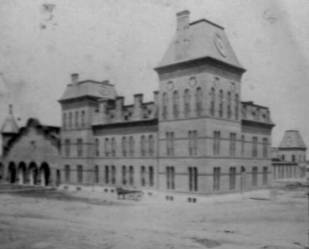 The Richardsonian Romanesque style became quite popular in railroad depot design. These masonry structures are generally known for their large, heavy round arch windows and doors, as seen in the image below. During the early decades of the 20th century, Beaux-Arts Classicism gained popularity for large railroad stations. This monumental style, seen below, emphasizes Classical details and has a rich, textured surface and a significant amount of ornament. 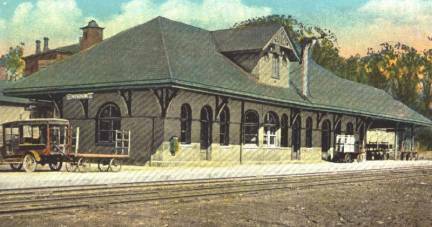 Smaller stations were likely constructed in the Colonial Revival style, which was quite popular during the early 20th century. The Colonial Revival style also employed Classical details but in a much more modest way, reminiscent of early American Colonial architecture.